Giants, witches, spirits, astral-projecting Lapps, beserkers and seers populate the sagas as densely as happy-drunk kids on Saturday night Laugerstraat, Reykjavik’s main drag. Some scholars note a drift from the earlier, almanac-like sagas to later more fantastical productions, where a hero might slay a hundred-odd warriors and where the supernatural dial gets cranked up to 11. One of the best-known ‘facts’ about Icelanders is their alleged belief in faeries (though whether this is based on a firm conviction or whether it’s more of a ‘Don’t mess with it just in case’ belief seems linked with alcohol consumption.) Drive through Iceland’s back-country, however, and the cuteness of talk about elves and trolls begins to wilt. Stare for long enough at Icelandic rock faces, and faces are what you start seeing. Places like the eery Lake Lagarfljót (home of the Wyrm, a sort of carnivorous Nessie) and the otherworldly Ásbyrgi (a horseshoe-shaped ravine and one capital of The Hidden People) take the imagination hostage, and the way I read the dark magic sections in the sagas won’t be the same. Uncanny episodes in old tales, I also learnt, can act as symbols: the habit of sea-eagles in East Iceland, for example, to carry off new-born babies (especially unwanted female ones) can indicate infanticide by exposure. “She’s one of ours”, says Agusta Thorkelsdottir, slowing down her car and pointing at a sheep munching grass by the side of the road near Vopnafjordur in the north-east of Iceland. The local Vopnfirdinga Saga isn’t translated into English, so Agusta talks me through the plot using pictures drawn by local primary schoolers. Her lively tour of the sites has taken us past her family’s farm, and I ask Agusta if she identified the sheep by its ear-tag. “No, no, I recognize her face”. The rural year is bookended by spring lambing and the autumn round-up, when the ewes and their summer-fattened lambs (“Two lambs to one ewe works the best” says Agusta) are gathered up for the van to the abbatoir. 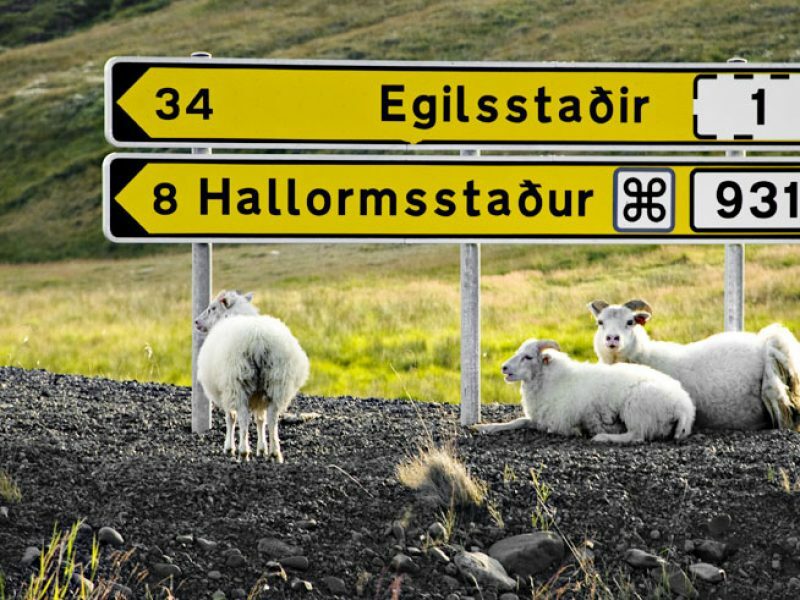 Until the recent invention of geothermally-heated greenhouses, agriculture in Iceland was sheep-farming, so it’s little wonder that many a saga vendetta is sparked by sheep-rustling or grazing disputes. An attack against your sheep wasn’t just anti-social behaviour – it was a direct attack on your chances of surviving the next winter. What was true for sheep was doubly true for family and clan. Security rested upon the strength and reputation of the family unit, and a slight against one member was a slight against the whole tribe. Many sagas are propelled by infringements against clan or family honour, and many chieftains find themselves honour-bound to shelter villains merely because they are relatives – with tragic consequences. In a society like early Iceland’s, lacking an executive branch of government, one’s clan took on militia-like powers – once you persuaded the General Assembly to sentence an enemy to outlawry, it was then your clan’s responsibility to kill the outlaw. Even today, the isolation of many towns like Vopnafjordur (especially in winter, when roads can be closed for months) means that the populations largely has to police itself. This engenders – to borrow the title from Iceland’s Nobel laureate Halldor Laxness’ masterpiece – a highly independent people. “There’s only one cop in town”, says Agusta with a glint in her eye, “and we all know when he’s on his holidays”. Antiquarian and artist Reverend William Collingswood visited Iceland in 1897 and his competent landscapes pop up in hotel lobbies all over the country. His Icelandophilia was sourced by the sagas and upon his departure he asked “‘[Was] it worthwhile, our pilgrimage to the Saga-steads? We have missed, we must confess, nearly all that attracts the tourist’. To which there can only really be one answer: ‘We have seen the homes of the heroes… It is as if a curtain had gone suddenly up: as if our eyes were opened, at last, to the glory of the North’.” Not being a Victorian reverend, I can’t quite get away with that, but I can attest that even a fortnight in Iceland affords an enrichening view of the Saga Age. It isn’t the landscapes, buildings, museums or original vellums that enhances my understanding so much as the modern-day Icelanders I met. Their pride, their humour, their easy-to-romanticise-but-very-real resilience in an environment where Nature herself finds it hard to scratch a living; and most of all, their literacy (one of Iceland’s numerous per-capita world records is its literacy rate.) A poetic bent and a gift for wordplay seem to be cool rather than nerdish in Iceland, and I was told that Icelandic neologisms coined to replace loan-words are warmly adopted (telephone is sími, an old word for wire.) The medieval sagas feed this legacy, just as they feed Icelandic with proverbs, similies and phrases. The Saga Age is still visible because the sagas still survive, and the sagas still survive because, for Icelanders, the sagas are textual treasure. To follow in David’s footsteps we’d recommend our 14-night Around Iceland self drive itinerary. Alternatively contact our Travel Specialists to discuss your options or request a holiday quote.